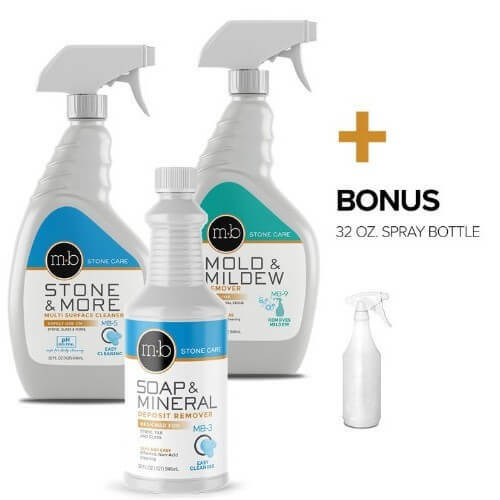 Premium Stone Care Bath & Shower Kit Deluxe contains all products needed to safely clean granite, travertine and marble showers, bathtub surrounds and countertops. Hard water deposits, soap scum, mold and mildew are potential problems in any shower or bathroom. 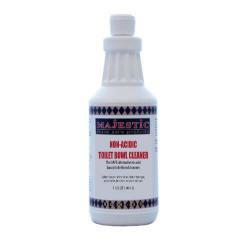 Keep your shower sparkling with superior-quality stone cleaners designed specifically to handle the demands of natural stone care in bathrooms without damaging the stone like common bath and household cleaners. Soap Film / Hard Water Remover is designed for use a your "regular" shower cleaner to cut through and remove the tough films that develop from daily shower use. Mold & Mildew Remover to quickly eliminate spots and stains from growth of mold/mildew. New gel clings to vertical surfaces and penetrates more deeply for superior performance. 32 oz. Spray Bottle with Trigger Sprayer (and 2 additional sprayers). 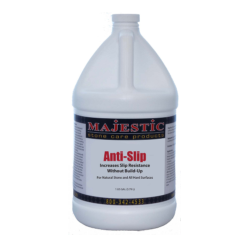 Use it to dilute the Soap Film / Hard Water Remover or to make a second bottle of any products in the kit. This product works better than the products I had been using! I ordered this kit because I was having trouble getting my all Marble bathroom counters and shower cleaned. Soap film was building up, and mildew in the corners. I was afraid to use any strong cleaning products, so this kit fit the bill. The soap scum remover worked very easily, barely any scrubbing needed. Same for mildew stain remover. The squeegee is very nice quality. Very pleased with products.